He has likened himself to the official behind home plate, calling balls and strikes. President Trump has made his choice to fill a second seat on the U.S. Supreme Court. His name is Judge Brett Kavanaugh. Here's the president in his prime-time address last night explaining why he believes Kavanaugh is the best pick. MARTIN: If confirmed, Kavanaugh would replace Justice Anthony Kennedy, who announced his retirement a couple weeks ago. Although, it's looking like Kavanaugh could be in for a tough confirmation hearing with several Democrats already lining up against him. NPR justice correspondent Carrie Johnson joins us now. Hey, Carrie. MARTIN: What should we know about Brett Kavanaugh? JOHNSON: He's young. He's only 53 years old. He was first appointed to the bench by President George W. Bush. And he's been sitting on the U.S. Court of Appeals for the D.C. Circuit for about 12 years. Brett Kavanaugh has checked virtually every box in the conservative legal establishment. Name something happened in the '90s, 2000s - he was involved. He was a clerk to Justice Anthony Kennedy. He was an aide to independent counsel Ken Starr, who was investigating President Bill Clinton's relationship with that intern, Monica Lewinsky. Brett Kavanaugh was also one of many lawyers who helped George W. Bush win the Florida recount fights in 2000. And after that, he joined George W. Bush's White House, first as a lawyer, then as staff secretary - sounds like a boring job; actually really important because he was touching every document that gets to the president. 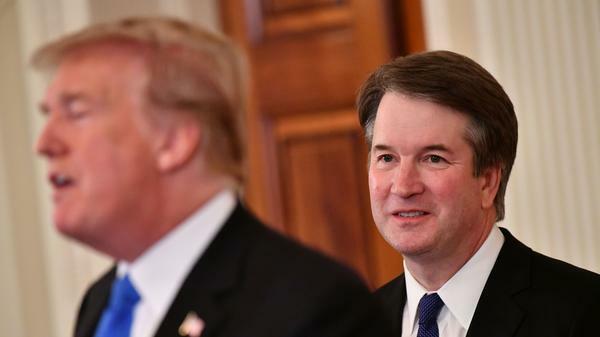 Brett Kavanaugh, even though he was super well-known in conservative circles, was not on Donald Trump's first list for the Supreme Court, but he's a favorite of the White House counsel, Don McGahn, and was added to the list later on. MARTIN: So he's been in D.C. a long time. He's got a long paper trail, has made a lot of decisions from the bench. You've had a chance to dig into his record. What stands out to you? JOHNSON: Well, importantly, Brett Kavanaugh said in the East Room of the White House last night, if he's confirmed to the Supreme Court, he'll keep an open mind in every case. But there are real things we can discern from reading his 300 or so opinions on the D.C. Circuit. One is that he has a really strong view of executive branch power. In fact, in 2009, he wrote a law review article that says a sitting president should be able to defer criminal investigations and prosecutions until after that president leaves office. Now, Kavanaugh said in the law review article if the president does something dastardly, there's always the impeachment process. Now, why does this matter? Because the current president, Donald Trump, is under - is the subject of a criminal investigation by the special counsel, Robert Mueller, who wants to interview and perhaps eventually subpoena President Trump. MARTIN: Democrats are raising all kinds of concerns right now that another conservative on the court could mean the federal law legalizing abortion could be in jeopardy. Judge Kavanaugh has written opinions on abortion cases in the past. What do they tell us about where he stands on this? JOHNSON: Yeah, the justice that Brett Kavanaugh is in line to replace, Anthony Kennedy, was pretty conservative but had sided with abortion rights supporters in at least one major case. Brett Kavanaugh's records suggests he's pretty conservative, too. Back in 2006, during his first confirmation hearing to join the federal appeals court, Kavanaugh told Democrats in the Senate that Roe v. Wade was binding precedent and he'd follow it fully. But more recently, he dissented in a case about a pregnant 17-year-old in immigration detention. She wanted to be released to get an abortion, Rachel. Ultimately, the majority of his federal appeals court ruled in favor of that 17-year-old, but Brett Kavanaugh said the court was acting in a radical fashion. He went so far as to say the majority of the court created a new right for unlawful immigrant minors in government detention to obtain an immediate abortion on demand. That language is raising a lot of red flags for abortion rights supporters right now. MARTIN: So Democrats are likely going to seize on that, I imagine. They already are. They're also going to seize on Kavanaugh's view of executive power, especially since he's written this thing in the past, about the fact that investigations are a distraction that's not good for the public, investigations around presidents. Is he likely to get any Democratic support? JOHNSON: You know, this is so remarkable. Even before Kavanaugh was announced as the pick yesterday, at least one important senator, Bob Casey of Pennsylvania, came out and opposed whomever Donald Trump would pick. Democrats led by Minority Leader Chuck Schumer of New York have come out in full force. Many have already announced their opposition to Kavanaugh. That said, Kavanaugh is not wasting any time. He's meeting with senators starting today. He's going to be accompanied by a familiar face to many of those lawmakers, former Arizona Senator Jon Kyl, who is highly respected and has a very good relationship with Dianne Feinstein, the top Democrat on the Senate Judiciary Committee who's likely to be grilling Brett Kavanaugh before too long in that confirmation hearing. MARTIN: The White House would like this whole deal to be done before the midterms, right? They would like Kavanaugh in place by October. Does that seem likely? JOHNSON: Yeah. Charles Grassley, who runs the Senate Judiciary Committee - a Republican from Iowa - says he's going to take his time in these hearings and be deliberate. There's always a period where the record of the nominee needs to be reviewed because Brett Kavanaugh has been on the bench for so long and because he has that experience in George W. Bush White House. There's going to be a lot of paper to review. But Republicans who are friendly with the White House think that given the record of past nominees and track record of how many days it takes from nomination to confirmation, it may be possible for Kavanaugh to be on the bench - on the bench of the U.S. Supreme Court by early October. The court has already announced its first case. It involves a timber company where some company land was designated by the federal government as a habitat for the dusky gopher frog. So that may be Kavanaugh's first case if he gets confirmation. MARTIN: All right. NPR justice correspondent Carrie Johnson - thanks, Carrie.